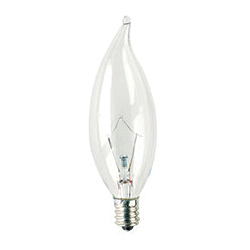 Krypton Bulbs provide a life of 3,000 hours. The Krystal Touch line includes flame-tip with a candelabra base, torpedo with medium and candelabra bases, and G-11 and G-16 styles, all with a clear finish. Operating on 120-volt systems, the models range from 10 to 60 watts.